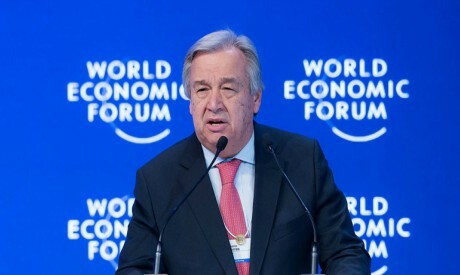 UN chief Antonio Guterres on Thursday appealed for dialogue in Venezuela to avoid the political crisis spiralling out of control, after opposition leader Juan Guaido declared himself interim president. "What we hope is that dialogue can be possible, and that we avoid an escalation that would lead to the kind of conflict that would be a disaster for the people of Venezuela and for the region," he said at the World Economic Forum in Davos. The United States, Brazil and other countries on Wednesday endorsed Guaido's declaration in repudiation of President Nicolas Maduro, as more protests rocked the economically strapped country. "Sovereign governments have the possibility to decide whatever they want," the UN secretary-general said on a Facebook Live broadcast from Davos. "What we are worried (about) with the situation in Venezuela is the suffering of the people of Venezuela," he said. Maduro has presided over a deepening economic crisis that has left millions in poverty as the oil-rich country faces shortages of basic necessities such as food and medicine. Some 2.3 million people have fled the country since 2015, according to the United Nations, while the International Monetary Fund says inflation will hit a staggering 10 million percent this year.